I admit it. I am bribing my kids with frozen blueberries so I can write up this recipe. But a bit of obfuscation is not necessarily a bad thing, right? So when I’ve been honing this recipe from a long-ago Yummy Mummy clipping, I’ve been covertly dosing my kids with big helpings of iron rich, green vegetables like Brussels sprouts, spinach, and leeks masked by cheeses and pasta sauces. But this is the best one EVER. 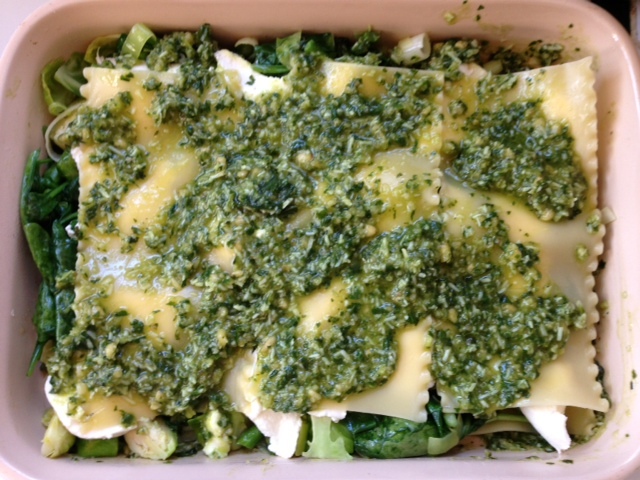 On a side note, there are so many ways to make lasagna – some with béchamel, some with marinara… But we love the easy, straightforward blending of pesto, veggies, cheese, and a few lasagna sheets for structure. Should you opt to skip the pasta sheets, it will be more like a green frittata in texture but still delicious… But we’re an Italian American household. Pasta is a bit ingrained in our thighs. 1 bunch asparagus cut into 2” pieces, bottom stalks removed. 5-7 sheets of lasagna pasta sheets – precook according to directions (usually only a few minutes). Drain well. 1 handful shredded cheese for topping, whatever you like. Warm olive oil over Medium High heat in a large pan or wok. 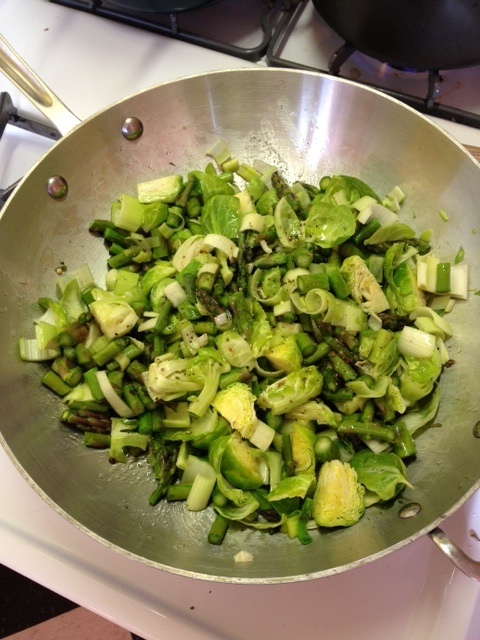 Saute brussel sprouts, asparagus pieces, and leeks for 3-4 minutes. Add in spinach and pinch of salt and pepper. Cook until barely wilted, another 2 minutes. Remove from heat. Green Veggies Sauteed (before spinach). Notice the rustic chop. Easy! 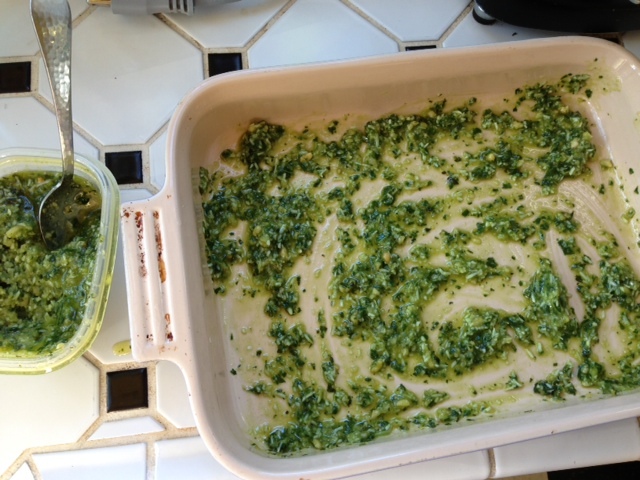 In a large flat casserole pan, spoon and smear pesto over bottom. 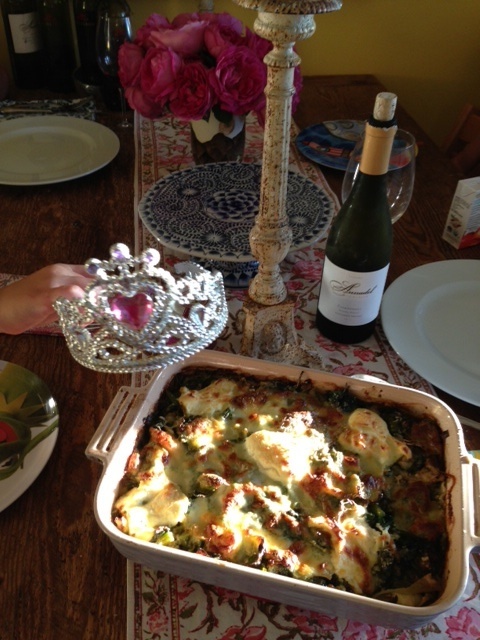 We used my Spinach Walnut Pesto tonight. Place 3-4 lasagna sheets over the top. Spoon half of the green vegetable mixture over the pasta. 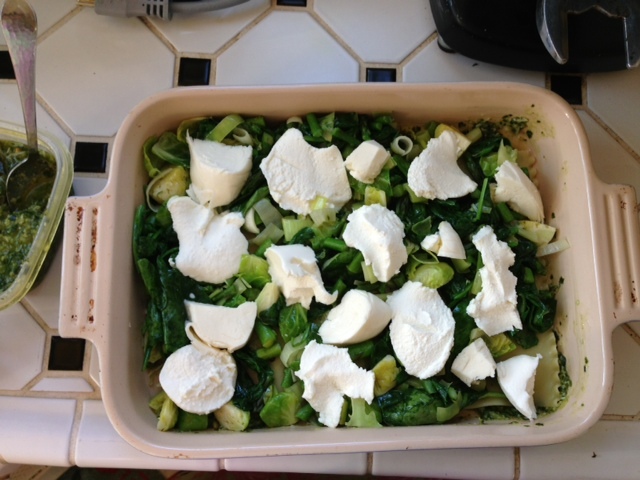 Next, spoon ½ of the ricotta cheese inevenly spaced globs on top of the veggies layer. Between the blobs of ricotta, put chunks of mozzarella. Place 3 lasagna sheets over the cheese. It’s fine if there are gaps between the layers – you don’t need too much pasta in this dish. 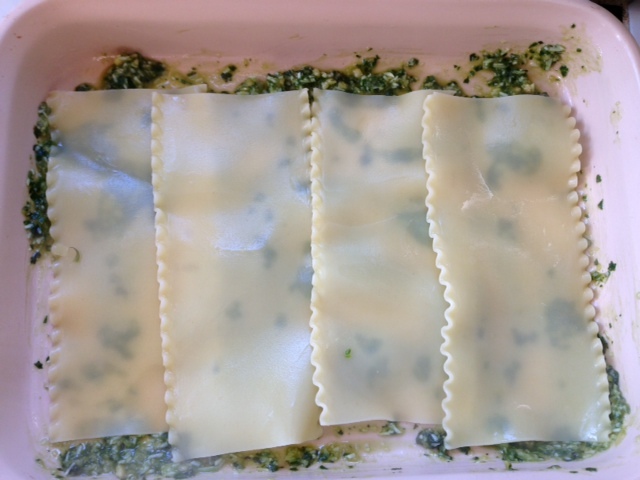 Cover this second layer of pasta with remaining pesto sauce. 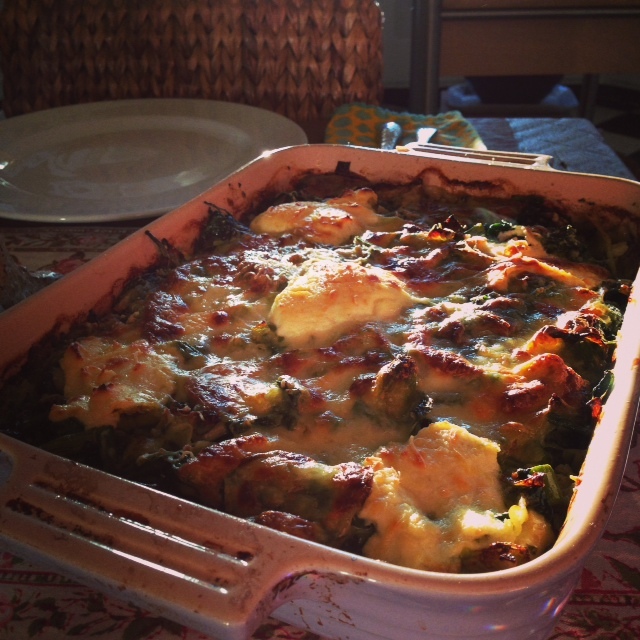 Cover with remaining veggies medley and cover with chunks of ricotta cheese and mozzarella. Sprinkle that last handful of whatever shredded cheese you have on hand. Last night, we used jack cheese. Cook uncovered at 350’ for 30-35 minutes. Crank heat up to 450 and brown the cheese for 10 additional minutes (if needed). Remove from heat and let the dish stand undisturbed for 5-10 minutes — this lets oils cool. Very important! Serve immediately in wide bowls and with a solid wine like Annadel’s 2010 Estate Blend, 2012 Chardonnay (seen here), or Muscardini Cellar’s Sangiovese. This entry was posted in Entrees, Uncategorized by Abigail. Bookmark the permalink.